If you weren't sure whether Sting was a serious composer and artist, "The Last Ship" sort of seals the deal. Yes, there was the Police, and a long solo career with lots of hits. There was an album of lute music, and traditional Christmas songs. But now Sting tackles Broadway. "The Last Ship" was presented last May in a one time only workshop for potential Broadway backers. 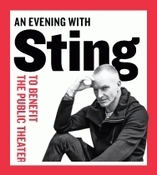 And now Sting himself, with his own village of musicians and some unusual guest stars, is performing the songs at the Public Theater to raise money for Shakespeare in the Park. The ten shows run through October 9th in a 260 seat theater within the Public, up on the third floor. Last night's premiere included in the audience Sting's wife Trudie Styler, their actress daughter Mickey Sumner, Oscar winning filmmaker Paul Haggis, and an audience that was pretty overwhelmed by the enormity of what Sting has done here. With playwrights John Logan and Brian Yorkey, Sting has fashioned a sturdy musical about his childhood in Newcastle, Northern England, where the shipbuilding business is running aground. For the show at the Public, Sting guides the audience through some of the show, giving away enough to explain the context of the songs. They've just been released as an album called "The Last Ship," his first collection of new songs since "Sacred Love" in 2003. Yes, that was ten years ago. The new songs are meant to fit the musical's storyline, but it turns out they played pretty well on their own. The title song, "The Last Ship," and a stomping pub number called "What Have You Got" are still the standouts, but not the only memorable melodies. The show (and the album) is full of them. Some of them sound "Sting"-ish, and some sound classically like blue collar singalongs from Newcastle. But there's a whole other group that sport a very Richard Rodgers like texture. They are true Broadway songs, still hatching but nearly born, with gorgeous melodies that should have no trouble being enlarged in a theater setting. I dare say we're hearing the Best Score and Musical of the 2015 Tony Awards taking shape at the Public. My favorites include a stunner called "The Night the Pugilist Learned How to Dance" and "Dead Man's Boots." Another pub number, "Show Some Respect," is going to be a curtain call reprise favorite. And just to allay fears of die hard fans, you will hear a few songs from Sting's remarkable catalog woven into the story: "All this Time," "When You Dance," and "Ghost Story" fit seamlessly into the presentation. Kudos to musical director Rob Mathes, to the whole band of players including singer Jimmy Nail and regular band vocalist Jo Lawry, guitarist Dominic Miller, bass player Ira Coleman, violinists (and siblings) Kathryn and Peter Tickell, and to the enormously gifted Wilson family of extraordinary singers - five brothers - imported just for the Public shows from the north of England. I hope they come back soon. Sting is annoying, isn't he? Like Paul Simon, Elton John, and David Byrne he just keeps stretching, finding new idioms, and conquering new genres. Who will play Sting on Broadway next year? That was the burning question posed - sort of - Wednesday night at the Public Theater, as the pop veteran launched a 10-night run of benefit concerts introducing songs "inspired by" his first musical, The Last Ship, due to arrive on the Main Stem in fall 2014. Billed as An Evening With Sting: The Last Ship, the show placed the international star in the Public's 260-seat Anspacher Theater, where he explained to an audience including fan-club members and lottery winners how he conceived his virgin project as a musical-theater composer/lyricist. Set in a Northeast England, where he grew up, it features as its hero a man who is, like Sting, the son of a shipyard worker, who leaves his small community and remains "very ambivalent about where he comes from..."